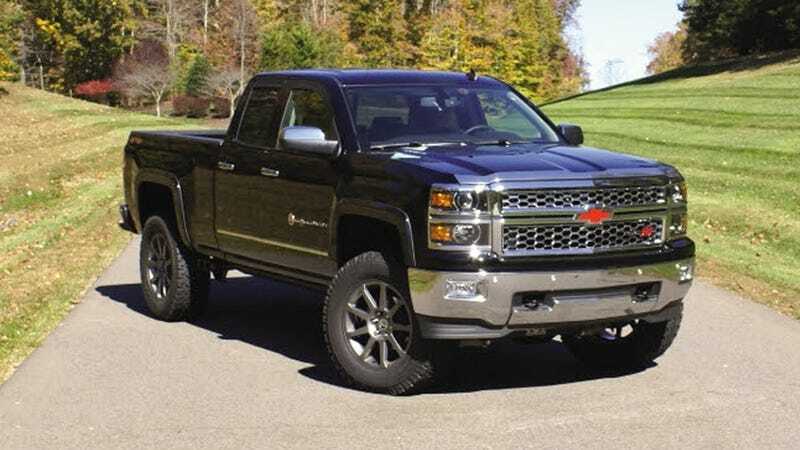 Longtime Corvette tuner Reeves Callaway has partnered with Rocky Ridge; a company that generally jacks-up 4x4s, to make this high-riding supercharged monster of a 2015 Chevy Silverado you'll be able to buy at a GM dealer. The supercharger is a third-generation Callaway design, introduced earlier this year fitted to the latest Callaway Corvette. More air, better cooling, dialed in for a broad powerband of torque. An Eaton 2300cc TVS rotor pack was selected for "high adiabatic efficiency," which is your new-vocab word of the day and basically means it maintains a consistent temperature. A three-element intercooler is used to keep the system cool; which Callaway was was "dynamometer testing simulated sustained severe service, resulting in inlet air temperature increases of less than 10ºF during repeated test cycles, compared to increases of at least 35ºF with other intercooler designs." Exhaust gets kicked out through a high-flow side-exit system. A mild lift and some fresh wheels rounds out the kit; none of which revokes the GM factory warranty. All the add-ons are warrantied separately for three years.